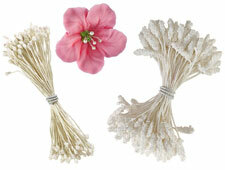 Finish your royal icing or gum paste flowers with a beautiful natural look using one of these 3 lovely stamen styles. Just pipe a dot of icing for your flower center, cut stamens to desired size, insert and let dry. Includes 60 each in Pearl, Glitter and Fluffy styles. May be tinted (except Pearl) with Wilton Icing Colors added to vanilla extract. 2 1/2 in. long with stamen on each end.